Kim Byeol-ah reportedly likes historical fictions very much. “Sakmae and Jami” is her first attempt at writing a historical and fantasy novel. The story’s development and its temporal setting are far from reality and Sakmae’s battle against the river water can be construed as an element of fantasy. The story is categorized as a historical fiction, but its focus is on entertainment, on escaping from reality. Sakmae decides to build an altar and offer a prayer. Despite his prayer, the river grows even more menacing. Sakmae calls the river the devil and orders his troops to attack it. Arrows flew in an arc and struck deeply into the ponderous body of the yellowish roiling river. 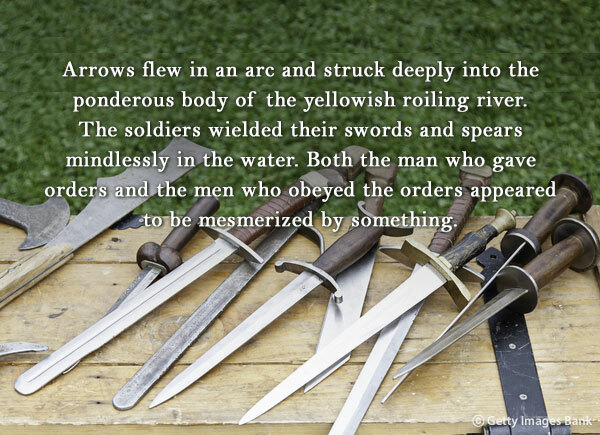 The soldiers wielded their swords and spears mindlessly in the water. Both the man who gave orders and the men who obeyed the orders appeared to be mesmerized by something. 화살들이 포물선을 그리며 날아가 누런 용틀임을 하고 있는 강물의 둔중한 몸피에 푹폭 꽂혔다. 병사들은 강물 속에서 정신없이 칼과 창을 휘둘렀다. 가릴 것 없이 무언가에 사로잡힌 듯하였다. Sakmae’s men, who gained a heroic victory against the torrential rain and violent river, entered the fortress as its master. Jami took off her masculine disguise and let down her hair. Jami was not a voluptuous or flashy woman, but a woman glowing with elegance. Sometimes, she would fascinate those around her with her otherworldly beauty. That was the oath he had often heard since entering the village of the Huns after Sakmae had defeated the river god two years ago. “우리는 언제고, 어디든 함께 갑니다. 당신이 낙양에 간다면, 나도 그 곳에 갈 것입니다. 흉노의 마을에 입성했을 때부터 빈번히 들어온 다짐이었다. Kim Byeol-ah: Born in Gangneung, Gangwon-do Province in 1969. Debuted when her novella “Wind Sound Outside the Closed Door” was published in literary magazine Silcheonmunhak in 1993 and won the 1st Segey Munhak Prize for “Mishil” in 2005.